Published in London by Folio Society. 2008. First Thus. Fine Hardback. No inscriptions or bookplates. Fine solander box . Letterpress edition in a solander box Limited Edition of 3750 numbered copies of which this is number 249. A Letterpress edition of Shakespeare's play, created with the highest quality materials and craftsmanship. 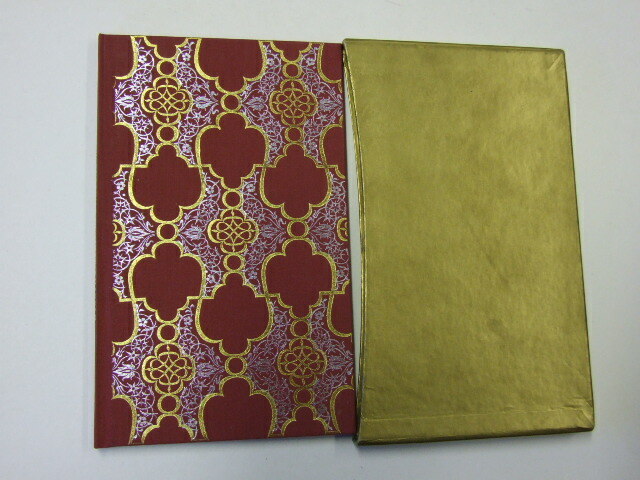 Quarter-bound in goatskin leather, blocked in gold with hand-marbled paper sides; gilded top edge and ribbon marker. Set in 16pt 'Monotype' Baskerville, printed by letterpress on mould-made paper. Letterpress volume: 14" x 10�". A pleasure to read Shakespeare's glorious language lies at the heart of his plays and here, free from the clutter of notes, every line is given the appropriate space to breathe. The text is printed by letterpress, a method now used only for the very finest private press publishing. Meticulously set on a traditional monotype machine, rather than a computer, the type letters have been individually created from hot metal in the rarely used 16-point font of 'Monotype' Baskerville. The shape of each line, and the arrangement of lines on the page, are adjusted by hand to create the most pleasing overall effect for the reader. The layout of words on a printed page is as much an art as such ancient techniques as Chinese or Arabic calligraphy. Here, the text is designed by eye and set on a manual machine, not a computer. Each letter of type has been created from hot metal in the rarely used 16-point font of 'Monotype' Baskerville, chosen for its clarity and elegance of form. Tiny irregularities testify to the hand-crafted nature of the process, since the shape of each line, the very gap between letters, is adjusted by hand to create the most pleasing overall effect. A book is a pleasure of many senses: the feel of it in the hands, even the smell of the leather and ink all contribute to the enjoyment. Running your fingers over the paper, the difference between letterpress and litho printing is instantly discernable. You can feel the indentation where each letter has been impressed into the mould-made paper. This high quality paper is made from cotton rags and wood fibres dried on a cylindrical mould which produces the feathered edge known as the 'deckle'. The quarter-binding is of finest goatskin leather, dyed to a rich colour. The pattern on the hand-marbled paper sides is unique to each volume. The craftsmen and women who work on these volumes are rightly proud of their involvement in the project. From the hand-sewing of the pages to the blocking of each label in 24-carat gold, few books have had such care lavished on them. You can be confident that these exceptional editions will give pleasure for generations to come. Unmatched in comedy and tragedy, poetry and prose, Shakespeare's plays are the crowning jewel of the English language. The creation of beautiful reading editions worthy of their stature is a dream that all lovers of his works will understand � a dream realised in The Folio Society's Letterpress Shakespeare series. Here, Shakespeare's words are given the space and setting they deserve. 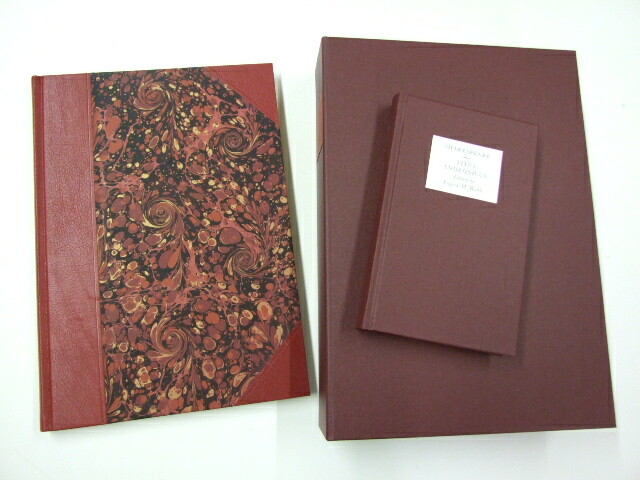 The meticulously designed pages and the clear and elegant type entice the eye to read, whilst the leather quarterbindings, gilded top edges and hand-marbled paper sides make these volumes a pleasure to look at and a delight to own.